This is a made to order item. Please allow up to 3 weeks production prior to shipment. 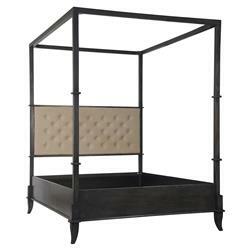 Dark and daring, this impressive, king size canopy bed is finished in matte black with an olive green, cotton tufted headboard. Constructed from solid mahogany, the four posts rise to impressive heights. Add sheers or tulle for a romantic finish or leave the gorgeous wood bare for a more modern, Industrial vibe.